Seals, gaskets, O-rings, enclosures and mastics often don’t work anywhere near as well as they should. The problem is that although they are excellent at keeping out water and oils as liquids, they often allow water or hydrocarbon vapours to pass through virtually unhindered. Versaperm Limited, a world technology leader in vapour permeability measurement, has introduced a quick and simple way to measure both the materials the seals are made from, and the finished products, joints, enclosures and equipment that uses them. Water and hydrocarbon vapours are extraordinarily invasive and the problems they cause have been estimated to cost billions of pounds in the UK each year. A simple programme of testing is often all that is needed to ensure that seals are effective. The new Versaperm meter was designed for this task. It can cope with several samples at a time, often give a reading in as little as 30 minutes – whereas conventional gravimetric measurement techniques take several days and are significantly less consistent. The WVTR meter is easy to use and gives a series of digital readouts that can be recorded or simply read off a screen. It needs no re-calibration and requires, at most, minimal training to give results that can be accurate to better than one part per million for some gases. 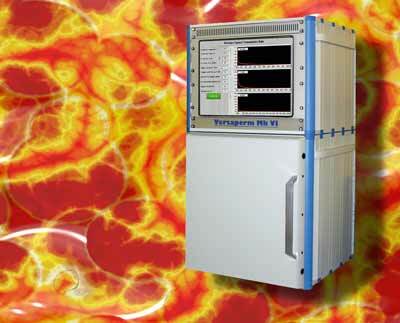 Sensitivities are in the range 0.05 – 3200g/m2/day. A wide range of configurations is available and a variety of vapour sensors can be used, from those specific to water vapour or hydrocarbons, through to those that can measure virtually any compound. Single and multi-sample systems are available for testing samples from the size of a thimble up to a pallet load and beyond. As well as manufacturing the instruments, Versaperm offers a vapour permeability laboratory service for companies that need to test samples on an irregular basis. For further Press Information please contact Gerry Palmer @ the Palmer & Rose Partnership.